Yanomamö feasts are ceremonial, social, economic, and political events. They are occasions for men to adorn their bodies with paint and feathers, to display their strength in dance and ritualized aggression; for trading partnerships to be established or affirmed; and for the creation or testing of alliances. 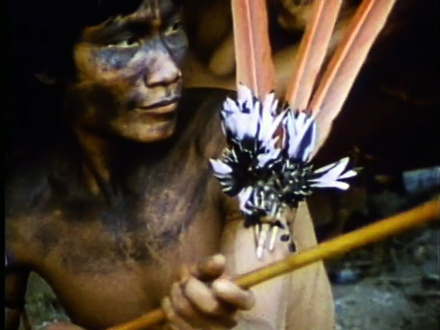 In this feast, filmed in 1968, the Patanowa-teri had invited the Mahekodo-teri to their village. The two groups had been allies until a few years before this event, when they had fought over the abduction of a woman. They now hoped to renew their broken alliance, which they did successfully. Soon after the filmed feast, the two villages together raided a common enemy. A detailed discussion of this feast, and of the significance of feasting among the Yanomamö, is found in chapter 4 of Chagnon's Yanomamö: The Fierce People. The film's graphic representation of reciprocity and exchange may enrich (and be enriched by) a reading of Marcel Mauss' The Gift.